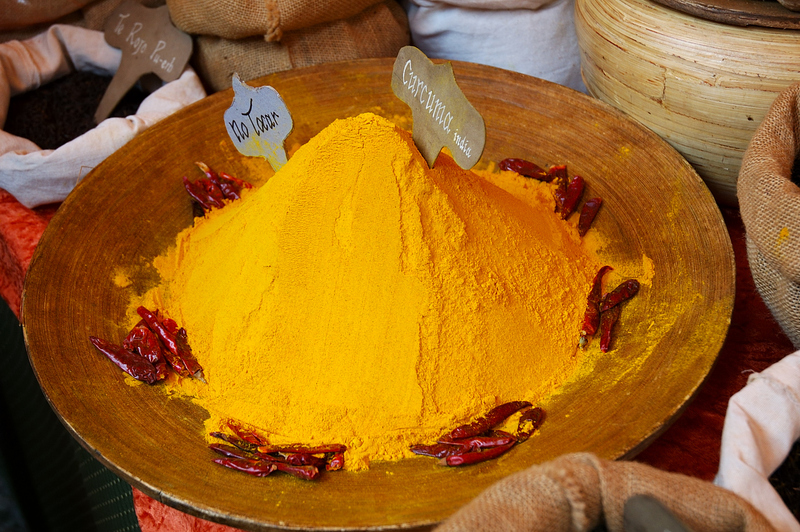 Resuming our Medieval Fair in Súria, we reach for the spices stall, where I couldn't refrain from firing a bunch of shots on this big bowl of Turmeric, a spice obtained from the dried and powdered rhizome of Curcuma longa, an Indian plant. It is an ingredient in curries and in the Middle Ages its color made it a cheaper substitute for saffron. It originated 4000 years ago and is linked to the Vedic culture in India where it was used as a culinary spice and had religious significance. The name derives from the Latin terra merita “meritorious earth” due to the resemblance to the color of some minerals. It can be used as a dye for cloth or be added to chicken broth or dairy products such as margarine. Curcumin, the active ingredient in turmeric is considered to have medicinal properties as an antibiotic and anti-inflammatory. Although I am not particularly fond of yellow I have to admit that Curcuma makes a wonderful subject for a colorful picture. Recommended: Photography Tutorials in pdf format at The Radiant Vista. You also have video tutorials, workshops, a wonderful podcast or a photoshop workbench. A must see. mmmm.....l'olor de les especies....l'olor dels viatjes feliços. Before I read your narrative the photo made me immediately think of open markets in India where spices are beautifully and sensually displayed. Your photograph is lovely; strikingly beautiful. And thank you for the link to the photographic tutorial! yes, we use a lot of tumeric here in Asia too. Beautiful colors!Thanks for your text,it's very interesting. "No Touch !" Very cute! This is so attractive, I love the earthen dish and bright yellow of the tumeric. Many thanks for the link to The Radiant Vista, I put the link in my favourites and will go back to it later. Appears to be a fantastic resource!